Welcome to PergolaKitsUSA.com, America's retailer of custom and standard size pergola kits and patio covers. Whether you're looking for a shady backyard structure under which to cook up a barbeque, or a modern centerpiece for a commercial property, we have what you are looking for. We founded our company to help you create a distinctive look for your property with an investment that will last decades. But the most satisfying part of our business is that we help you create the atmosphere to enjoy the outdoors with your friends and family. It is for this reason that we coined the slogan "Great times...delivered straight to your backyard!" How Big of a Pergola do I Need? Only you can answer that question, and it will depend largely on the layout of your property. But we can share with you some basics about how pricing works in the shade structure industry, which will help you weigh your options. Price per square foot decreases as square footage increases. For example, the smallest kits, those that give you 64 sq. ft. of space (8 x 8=64), are priced the highest on a square foot basis. From there, prices per square foot drop sharply as you go up to about 120 sq. ft. After that, the price per square foot continues to drop, but at a slower rate. All of this is due to the ratio of wood/area (or vinyl/area, etc. ), and to semi-variable costs of shipping and production. If you buy a small model (8x8 size or a 10x8 size) you will be paying the highest price per square foot. Prices for small models run 30% to 50% higher than large models on a per square foot basis. If you buy a model that is a bit larger, say an 11x11 or a 12x10, you will be paying more than an 8x8, but you will get more for your money on a per square foot basis. The advantages of a larger structure are that you can entertain more guests under it, and you can fit more under it, such as an outdoor kitchen, a fire pit, a hanging swing, furniture, etc. Consider this: A 12x10 gives you almost 100% more room as an 8x8, but it only costs 25% more on average. That’s a 4:1 ratio to your advantage. If you live in a northern region that has a milder summer, there is less of a need for a huge design in your backyard. The further south you get, the more frequently you will want the benefits of shade. On the other hand, we have sold designs to customers in rainy regions who put their covered roof models to good use. In the pergola industry, "attached" means wall mounted, while "free standing" means anchored to the ground. A pergola attached to the house is generally less expensive than a free standing design because an attached model only has two support columns instead of four. Fewer columns and lower shipping costs leads to a lower priced product for you. Sometimes you will see these models advertised as a "two post pergola" or a "wall mounted pergola". To roof or not to roof? A pergola with a roof is called a pavilion. These are more expensive because of the extra material and craftsmanship required to create the roof. Roofs are heavy, and therefore cost a lot to ship. But a design with a roof arguably has more utility because it offers more shade from the sun and shelter from rain. Covered pergola kits may simply have a look that appeals to you. They have a more solid look, and some say a more inviting look, almost begging visitors to relax under their shelter and stability. If you want to take a look at our covered models, check them out here. If you don’t want to spring for the roof, but still want the option of shade, then a good compromise is a "retractable roof pergola". These models have a canopy that is tailored to fit your outdoor structure exactly. The canopy can be moved back and forth, depending whether you want to soak up some rays, or cover yourselves (and your dining table!) from a sudden mid-afternoon rain shower. You will see these models sometimes advertised as a "retractable pergola", or "retractable shade pergola". They are all the same concept. Our most popular model to fit with a retractable canopy is our Serenity model in Western Red Cedar. It comes in a over 256 sizes, including 14x14, 14x16 and even 20x20. In fact, we make it in any size! We customize the size for you down to the inch at no extra cost. Just give us a call and we will create your drawings for you to review and have us edit. Arched pergolas are beautiful, but they are a bit more expensive than other types. If you want to save some money, you many want to consider a different style. On a per square foot basis, arched models may cost 20-40% more than other styles. For example, for a 16x16 size, the arched design may cost you some $1,600 more. Sometimes you will see these advertised as "curved pergolas". California Redwood is the most expensive of all outdoor woods. This is due to its limited supply. The mature heartwood commands a further premium, but has a gorgeous reddish hue that is darker and more uniform than common California Redwood (also less discolorations and knots). The mature heartwood also has a tighter grain than cedar that appeals to many. Of all the wood species, redwood it is the most resistant to decay. Redwood will last for decades with little to no risk of rotting. Wood eating insects tend to avoid redwood; it contains phytochemicals that disagree with them. In fact, felled redwood can lie dormant on the earth for decades and still be in good shape. We are so confident of the durability of our redwood, that we back our redwood models with a 15 year warranty. 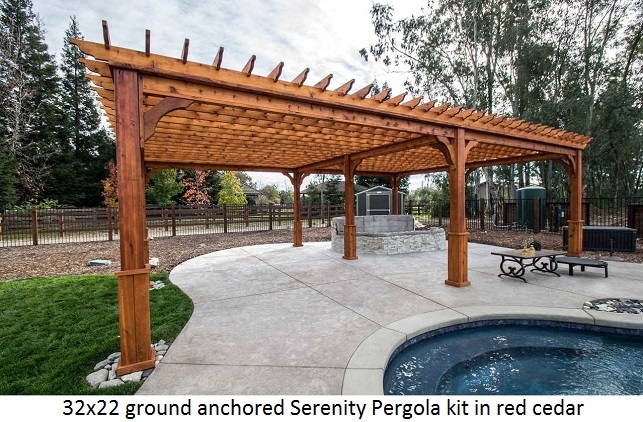 A redwood pergola kit looks fantastic in any landscape setting, particularly when new. The only disadvantage of wood is that the color will fade over time and the wood will turn gray, as will all wood. But this can be prevented by treating the wood with a sealant every few years. But if you don't want the hassle of maintaining the wood, look to vinyl or fiberglass. They are maintenance free materials. 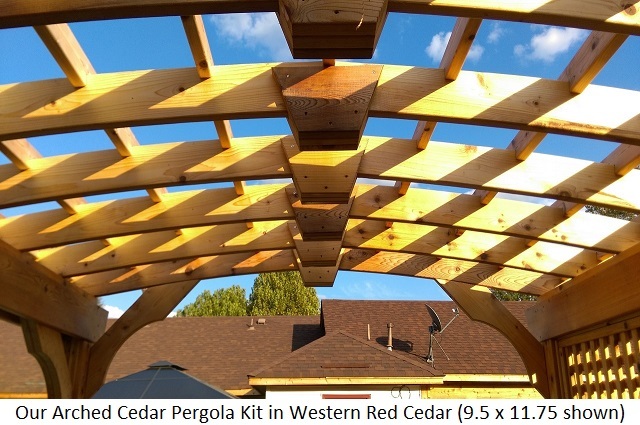 I would venture to say that there are more cedar pergola kits sold each year than any other type. Cedar is the most common wood used for all types of backyard structures, including gazebos, pergolas, sheds, decorative bridges, furniture, etc. In North America, there are several species of cedar. But we use Western Red Cedar for our structures. Western Red Cedar grows in the Pacific Northwest. It looks better than other cedars, and is the most durable and decay resistant of all cedar species. It is also abundantly available in North America, so therefore is much less expensive than California Redwood. Like California Redwood, Western Red Cedar will turn gray over time unless treated with sealant every few years. Cedar's durability and decay resistance is excellent, and among North American wood species is a close second to California Redwood. 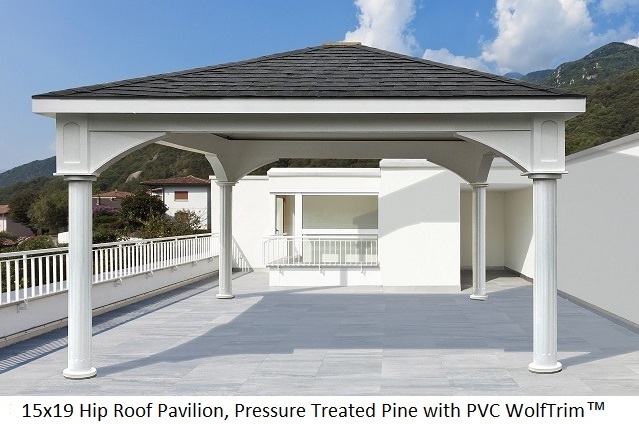 Pressure Treated Pine: If you want to paint your backyard structure, we recommend you consider pressure treated pine. It is the least expensive of the three woods we have discussed so far. It is not as attractive as California Redwood or Western Red Cedar, but if you plan to paint it, the paint hides this weakness. Painting does require maintenance through the years. Consider painting yours white for a wedding or catering atmosphere. Or paint it grey or light blue for a nautical or coastal landscape. Or paint it brown or black if your property is wooded. Fiberglass pergola kits, (also known as "composite"), are a completely different look. Don't want a country-ish or rustic structure in your backyard? Rather have a modern, contemporary centerpiece? Then consider a fiberglass model. Our structural fiberglass is lighter than wood, but pound for pound stronger than steel. Fiberglass composite does not rust, rot, warp, bend, or suffer from insect attacks. And if you want a waterproof pergola, but are not comfortable with vinyl, them fiberglass composite is the way to go. Another big advantage of fiberglass is that it comes in any color you can imagine. We will paint your fiberglass pergola in any color you want for only $249. The only disadvantage of fiberglass relative to wood and vinyl is that it is more expensive. All of our wood and fiberglass models can be customized to your sizing preferences. Vinyl has come a long way since the 1980's. It used to be that the biggest advantage of vinyl, also known as plastic, is that it was the least expensive of all the different materials. Vinyl used to have a shorter useful life than wood or fiberglass composite. It used to crack and warp over time. And it usually came in only one color, white. But times have changed. So much so that today many believe vinyl is the preferred material for outdoor backyard structures. Today, vinyl comes with sun-protective additives that extend its useful life. Vinyl fence and outdoor structure makers provide multi year warranties on their products, some as long as 25 years. Vinyl is maintenance free, but it more costly than wood. It cannot be painted, although PVC trimboard can be be (our patio covers and pavilions feature Wolf Trim ™ brand high density PVC trimboard). Should You Buy a DIY Pergola Kit, or Buy a Custom Pergola? 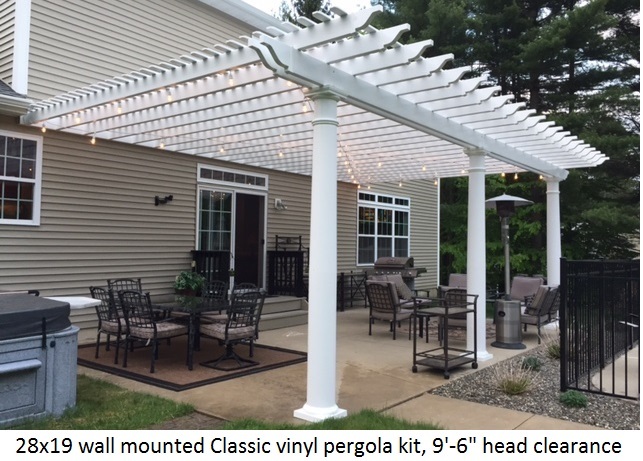 All of our pergola kits, whether labeled "DIY" or "custom", are DIY kits. There is no difference in assembly difficulty between the two. Second, there is no difference in price between the two (on a per sq. ft. basis). The only exceptions to these rules are if the custom pergola is an odd shape such as a trapezoid or rhombus. In these cases there is a price premium, and assembly may be modestly more difficult. For all orders, we provide you with a custom set of shop drawings for free. Your review them and make changes. Only when you are 100% satisfied do we begin production. Many people don't know this, and unfortunately they settle for a standard size kit size that doesn't quite fit their landscape perfectly. Often these drawings are sufficient to obtain permit approval from your local permitting authority. If they require an engineer's stamp, we can provide that also for a fee. 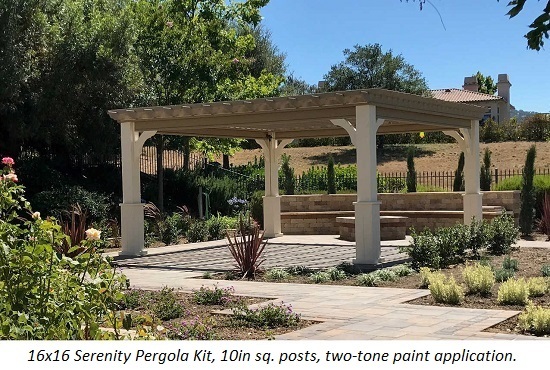 Regardless of whether you buy a standard size DIY kit, or have a custom pergola made specifically for your property, the pergola will come to you fully cut, with necessary holes drilled, and with instructions. You don't need special carpentry skills to assemble a custom pergola design. All you need is two people and some simple tools suggested in our assembly manuals. Two people can assemble our small to medium-sized pergolas in under a day, even a custom one. Pavilions, particularly larger sizes, can take several days. Assembly of our pavilion kits can take several days. Smaller sizes come pre-cut, and can be assembled in1-2 days. But larger sizes require cutting of the tongue and groove roof decking and will take several days time. 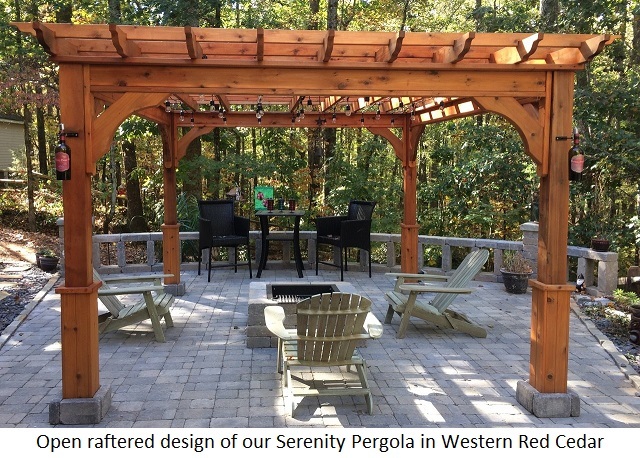 Pergolas: We ship all our pergolas as ready-to-assemble kits. Pergolas ship to you fully cut and with all necessary holes pre-drilled. All standard designs come with instructions. No special carpentry skills are needed to assemble. Two people can assemble our small to medium-sized pergolas in under a day. Tradesman typically assemble a 12x12 Classic Pergola in under five hours (excluding pouring of footings). Pavilions or patio covers (solid roof structures): All our standard designs come with an instruction manual. Difficulty level varies depending on whether you order a small size or a large size. Smaller sizes are fully pre-cut, include pre-assembled roof panels, and typically take 1-2 days to assemble. Large sizes take several days, require stick frame roof assembly (instructions available from us), cutting of some of the tongue and groove roof decking, and in general require skills beyond that of the average homeowner to assemble. We offer assembly services in Midwestern and East Coast states. If you live elsewhere we would be happy to email you suggestions on sourcing an assembler in your area. Custom designs including radius, trapezoid or rhombus shapes, do not come with assembly manuals, and may require additional skills to assemble.